I don’t know about you, but I have a really bad habit of buying an unsuitable amount of bananas. This goes both ways. Sometimes I don’t buy enough bananas, and find myself going insane because I always want something I can’t have, which is a statement that applies to both men and food, but more so food because let’s be real, eating banana pancakes when you didn’t think you could eat them is way more satisfying than getting a stupid boy you’ve been pining over for no reason at all. Unlike men, food is sustenance and you literally need it, but I digress. 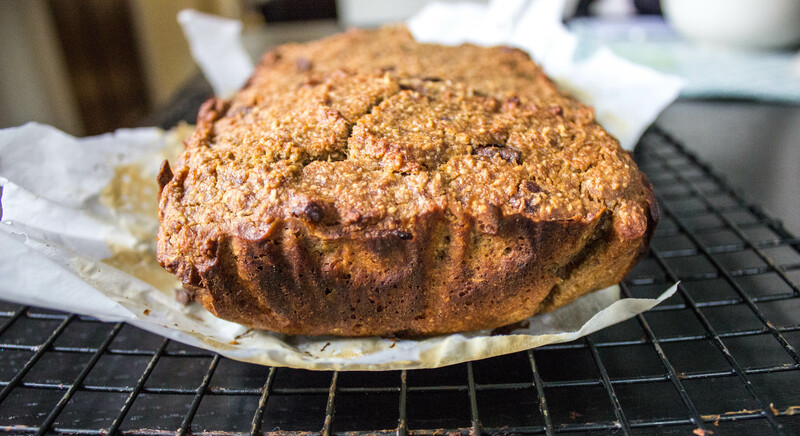 Since this recipe is for banana bread, you have probably realized this story is about buying too many bananas as opposed to the opposite. Sometimes I buy way too many and they die a slow, painful death with no company besides a literal heap of sweet potatoes, because my housemates and I also buy an unusual amount of sweet potatoes. I’m not sure why I’m going into so much detail about my grocery store habits, but whatever. 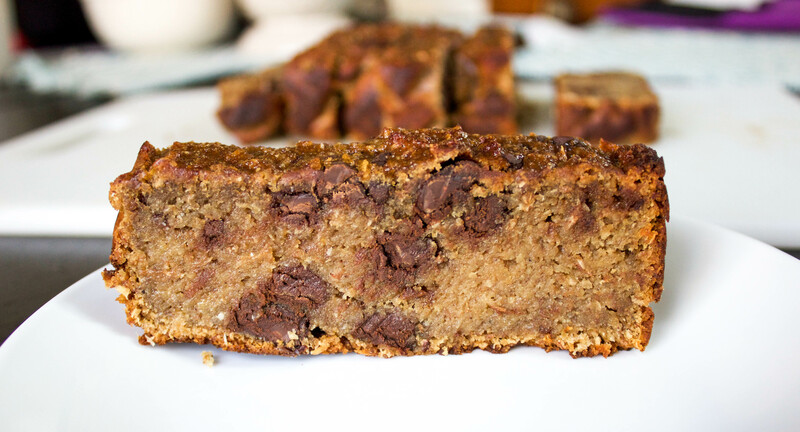 If your bananas are dying and deteriorating on your counter, make this recipe, because it’s bad to waste food but banana bread is also amazing. Just don’t forget to add bacon because when in doubt, add bacon. Preheat oven to 350 degrees and line a large loaf pan with parchment paper. Using a slotted spoon, remove the cooked bacon to a plate lined with paper towels to absorb the grease. Pat dry. In a large bowl, combine banana, egg, oil, vanilla, milk, and maple syrup. In a separate large bowl, combine all flours, shredded coconut, sugar, spices, espresso powder, salt, and baking soda. Add dry ingredients to wet and combine until fully incorporated. Add chocolate chunks and bacon and mix. Pour batter into parchment paper-lined loaf pan and spread evenly with a spatula. Put in the oven for 25-30 minutes, or until you insert a toothpick into the loaf and it comes out clean or slightly crumbly. Remove pan from oven, and let sit for one to two minutes. Remove bread from pan by grabbing parchment paper. Transfer loaf to cooling rack to cool completely. Or get a fork out and dig into it immediately, burning the roof of your mouth with scalding hot melted chocolate. Your choice. Oh.my. Love the quote about burning the roof of your mouth, but this really says it all “when in doubt, add bacon” So true! FYI, non-bacon – gasp – but frozen bananas make a yummy treat slathered with nut butter, to which you could of course add bacon OR put in a blender for fake ice cream…maybe with nuts added and topped with bacon crumbles or candied bacon crumbles? This sounds totally yum but will it take time away from serious worry about world peace? Love you hon. Have fun tomorrow in Richmond. We are thankful to have a grand granddaughter like you. We see you love bacon from your web bog. We are changing the cooking method of bacon forever, come see how at Baconness Bonanza! Check out our videos and posts.